This summer, the Oakland Department of Transportation (OakDOT) is bringing neighborhoods together to beautify their streets as part of a new program called "Paint The Town." 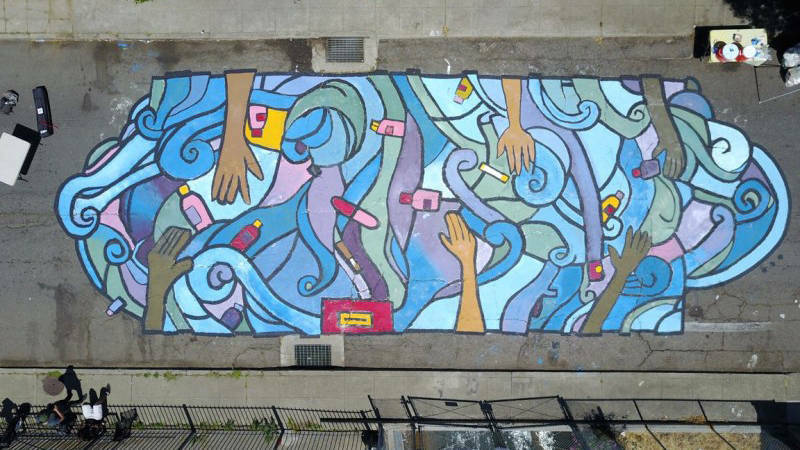 The program, which began in May of this year, supplies permission and resources to artists who want to paint temporary murals on Oakland streets. 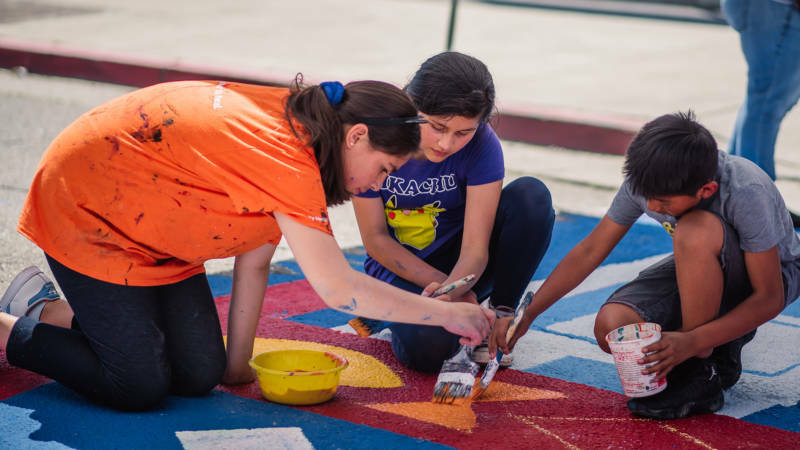 The OakDOT started Paint the Town with the intention of giving local residents a sense of ownership in their neighborhoods, especially in under-resourced areas. 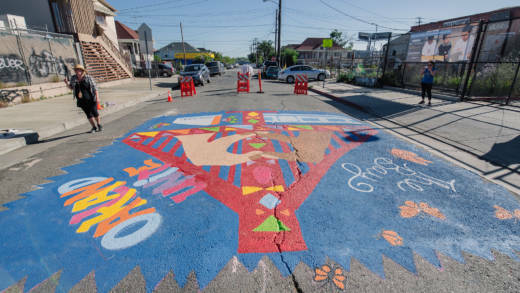 "Paint the Town is the first step in re-imagining what our streets are and what they can be," OakDOT transportation planner Lily Brown said. Paint The Town came about from the results of the city's 2017 Request for Community Interest survey. The 130 respondents said they wanted the city to use its resources to turn streets and crosswalks into works of art. "Transforming a busy street doesn’t always need complicated plans or millions of dollars. There is real potential for Oaklanders to create playful and artistic public spaces," the OakDOT report stated. After a call for submissions last winter, the city approved 30 mural applications. Each winner receives a $300 gift card for paint, plus liability insurance for the street closure. For seven winners, the Oakland Fund for Public Innovation pays for all materials and even assists with day-of logistics. Of the 42 applications it received, the city focused on approving applications for projects in disadvantaged areas. For every one mural approved in a census tract with a low level of disadvantage, the city wanted two in high-to-medium disadvantaged areas. In the end, the city surpassed its intended 2-to-1 ratio, approving 27 projects in high-to-medium neighborhoods and three in areas of low disadvantage. "We exceeded the goal for advancing equity in this program," Brown said. Paint The Town is currently in its pilot phase, but Brown says it's proven to be quite successful. Local groups have painted four murals since May—the most recent a giant hummingbird on 25th Street, between Telegraph and Northgate Avenues. Brown says the mural events are much like block parties, with the bonus of providing "an activity where people have to work together to accomplish something." She attended the first mural painting at Dashwood and Arthur in East Oakland, and said that the event was a joyous occasion where participants and visitors alike expressed pride in the resulting art work. "Some people even got out of their cars to take pictures," she said. "That's the best part about Paint The Town: it's something that seems really simple and relatively cheap but it has this huge, positive ripple effect," Brown added. "A street doesn't just have to be gray asphalt that cars are speeding through; it can be a canvas for people to showcase their neighborhood pride and their uniqueness. They can help foster a sense of ownership."